The fossilicious team is headed to DC for the American Montessori Society National conference that starts on Thursday. Of course Montessorians have been descending on the city since the weekend and lots of our friends have already checked in on Facebook and Instagram. We have some exciting NEW ITEMS for this conference! We’ve also packed many of the same products AMS teachers have been enjoying since 2005. Free Fossil when you share the secret passwords: Take a Closer Look! LOTS of new materials, extensions, updates and NEW FOSSIL FINDS! 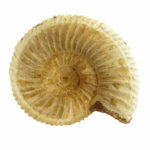 This Perisphinctes ammonite is one of the Fossils and crystals we will be giving away in DC. Claudia’s presentation, Cosmic Education: Using Brain-based Strategies, is Friday at 2:30 in Thurgood Marshall South. She’d love for you to join her! Check out our updated website www.fossilicious.com! Shop our site ahead of time and bring your list for quick service! Thanks again for reading! See you at L308! We’ll be in North Carolina for a 2-day workshop Friday, March 29 and 30. Stay tuned for more information on that coming soon! This entry was posted in Uncategorized on March 20, 2019 by Doug Mann.